Part three of this series covered tagging into the SPI communication between an Arduino Uno and a nRF24L01+, followed by the transceiver inside the quadcopter RC. We have seen registers being read from and written to for initializing the transceivers and how the pairing of the quadcopter might be initiated. In this part we will look at what really happens during pairing, have a brief look at the messages sent by the RC during normal operations and then we’ll try to create our own RC. The SPI interface of the RC goes silent after the pairing and would only become active again after moving the throttle to max and then to min (probably a precaution to make sure the throttle is set to zero before sending anything to the quadcopter). Moving the throttle stops the RC LED from blinking and the RC would beep. Since the beeping was a bit annoying and too loud for testing over and over during the nights (wife and kids already started asking questions…), I soldered the little piezo speaker out. As we might have expected from the init process, there is 8 bytes per package. Byte 7 indicates the positin of the +/- switch with ‘-‘ is equal to setting bit 4, resulting in a value of 16. For the “flip over” command, which is being activated by pressing down the pitch/roll stick on the RC, bits 0 to 3 of the last byte seem to get set, adding 15 to the switch value. As for the counters in bytes 2, 5 and 6, I’m not sure what they are supposed to indicate. Counter 0 would start somewhere at around 50 and count up, while the time intervals for each step seem to get longer and longer starting from about 1700 ms. Counter 1 and counter 2 start with values 101 and 116 (sometimes more, sometimes less) and would count backwards at totally different intervals. All counters jump back and forth between the numbers at each step, indicating that the numbers might be rather measurements than hard counters. I started playing with the voltage for the RC, changing it between 2.7 and 4.0 VDC and it does seem to have an effect on the counters. Maybe there is even a feedback from the quadcopter concerning its battery status. Unfortunately the quadcopter seems to be quite particular about the power input and won’t work when connected to a regulated external power supply. EDIT2: As it seems, the quadcopter does not send any feedback to the RC, which is quite bad when reaching battery low, as the aircraft just drops dead from the sky without any warning. Would be nice to have the RC beep before the battery is dying. The grey part on top of the wiring matrix is what you see looking at the nunchuck connector. Make sure to connect its VCC only to 3.3VDC, even though it might be running fine with 5VDC, it is not recommended according to most of the nunchuck tutorials. Adding a few calibration values matching your own controller (minimum / maximum range of the joystick x and y axis obtained by defining DEBUG mode and commenting out the pairing, tweaking pitch and roll for more or less agility) and… off you go. As soon as I get a little practice, I might add a video to this step (if the quadcopter doesn’t crash and burn in the meantime, but so far it seems to be quite forgiving…). It’s been quite a journey from reading the documentation over listening to the radio communication and eavesdropping on the SPI interface to the DIY quadcopter RC. My wife, rational as she is, asked me “what was it good for”? Well, first of all: It was fun. There was a mystery and I was able to solve it (even though there might be a few little secrets left). Second: I learned more about reverse engineering in general and the SPI interface in particular, and that it is not as hard as it might seem. Third: I created my own RC, which might not be that big of a deal or more accurate than the original one, but still, it is working and that’s a big reward. As it seems, the original RC switches channels during normal operation, probably based on the number of lost transmissions. This might explain why my aircraft is acting up a little from time to time (it cannot be all pilot induced…!). You have to keep in mind that Wifi and Bluetooth are both working on the same frequency and if you’re living in a crowded neighborhood with a lot of access points and chordless speakers… well, you do the math. The Wii Nunchuck was rather easy to use. You might even try and hook up the Arduino to the trainer port of your much fancier RC. (Did that to use the two free channels of my Futaba T7C, controlling the pan / tilt of a camera mounted to my RC plane, but that’s a different story to be told) Or control it with a smartphone like the Parrot AR.Drone. The list could continue forever (e.g. 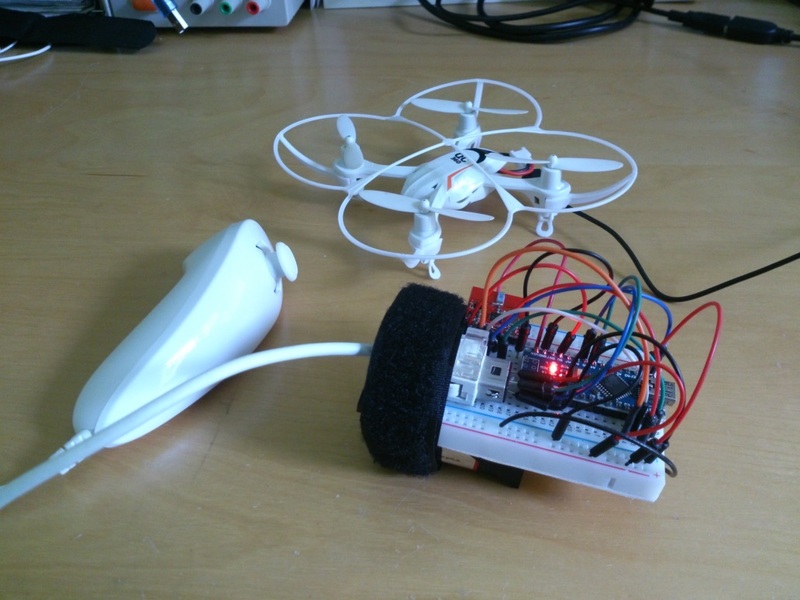 adding an on/off switch to the quadcopter or a bigger battery). For me, apart from the promised video, this project seems to be complete. Husband, Father, computer scientist, commercial helicopter pilot. Full of ideas and open minded, I try to see challenges in what others call problems. This entry was posted in Projects, QC-360-A1 and tagged Arduino, nRF24L01+, Quadcopter, Reverse Engineering, RF24, SPI. Bookmark the permalink.